SCOTTSDALE – The Waste Management Phoenix Open is practically down the street from Arizona State University. For Sun Devil standout Jon Rahm, it’s the biggest stop yet on his ascent to the pros. 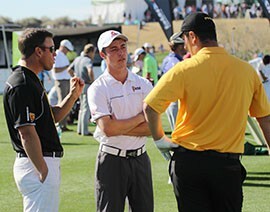 Rahm, a junior at ASU, was selected as one of five sponsor-exempt golfers invited to play in the tournament. The honor comes after a stellar year for Rahm, who broke Jack Nicklaus’ 72-hole individual record at the World Amateur Team Championship. It’s the amateur’s second time competing in a pro event; he played in the OHL Classic at Mayakoba in Mexico during the 2014 PGA season. In that event, the Spanish native failed to make the cut. This time around, Rahm is setting the bar high. If the 20-year-old hits his goal and wins the Waste Management Phoenix Open, he would become the youngest champion since 1932. Rahm, the No. 3 ranked amateur golfer in the world, continues a legacy of Sun Devils who have launched successful PGA Tour careers. Several are playing this weekend. Phil Mickelson is the most notable name of the group, with five majors under his belt and a spot in the World Golf Hall of Fame. Mickelson had nothing but praise for the rising star. Rahm will also be bringing along friend and teammate Ben Shur. The fifth year senior serves as his caddie. Shur recently caddied for Rahm at the Spanish Amateur Championship last year. “I think it’s going to be a lot of fun to help him succeed in this tournament,” Shur said. With record crowds expected and a rowdy atmosphere guaranteed, Rahm and his coach feel the environment will only enhance the Spaniard’s pro tournament experience. Though he's the only amateur in a Waste Management Phoenix Open field overflowing with marquee names, Sun Devil junior Jon Rahm is looking to make the most of his sponsorship exemption and compete for his first PGA Tour tournament victory. Arizona State junior golfer and Waste Management Phoenix Open particpant Jon Rahm, right, talks with caddie and ASU teammate Ben Shur, center, and coach Tim Mickelson on the driving range.